When the newly minted Congressman Steve Daines stepped into the press conference he wore cowboy boots, standard issue for Republican Congressmen from Big Sky Country. What set him apart were the words that came out of his mouth. Daines, a Bozeman businessman elected in November, held the conference to announce his support for the North Fork Watershed Protection Act. The act would prevent hardrock mining, energy development and coal mining in 400,000 acres of the North Fork of the Flathead Valley, immediately adjacent to Glacier National Park. The bill is supported by Montana Sens. Max Baucus and Jon Tester--both Democrats. 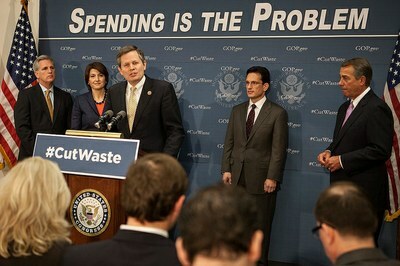 Rep. Steve Daines speaks at a House republican leadership press conference. Here’s what I found remarkable: It was the first time Montana’s entire congressional delegation — of both parties and both houses — agreed on a piece of public lands legislation in at least 25 years. Just three months into office, Daines was clearly trying to step from the shadow of his predecessors who made a tradition of green-baiting and driving partisan wedges. Granted, the North Fork bill is a no-brainer: It protects the watershed of the North Fork of the Flathead River, one of the most stunning streams you’ll ever see, some of the cleanest water in North America, and a blue-ribbon trout stream that helped inspire the federal Wild & Scenic Rivers Act. Even so, Daine’s republican predecessor, Rep. Denny Rehberg, could not bring himself to say anything good about the bill, nor lift a finger for it. Conversely, Daines promised to introduce the bill in the House of Representatives, waxing poetic about the importance of protecting Montana’s pristine natural resources, both for our outdoor way of life and our economy. He went on to tout his own business experience, as an executive in a burgeoning, Bozeman-based software company, RightNow Technologies that went from fewer than 100 employees to more than 1000. That public land helps attract jobs and investment is not revelatory information. The economic value of Montana’s protected public land has been documented by experts like those at Headwaters Economics. However, as an employer and a statesman, Daines delivers it with authority. He also speaks of the things that go beyond dollars and cents, like the joy of roaming the high country or casting an elk-hair caddis into alpine lakes. I don’t expect Daines to be an environmentalists’ superhero. Before he made the announcement in West Glacier, he toured the giant Plum Creek sawmills in nearby Columbia Falls. He campaigned on his support for the Keystone XL Pipeline. I do expect Daines will catch flak for warming up to Democrats and their ideas on conservation, even a little. His ideological right flank may put up a challenger in the next primary. The partisan pressures of the Beltway have yet to exert their maximum pressure. But Daines has clearly done some political calculus. He knows he has far more to gain than lose. He has a path to be a congressman for Montana’s future, not just its past. Ben Long is an outdoorsman, father and conservationist in Kalispell, Mont. He is senior program director for Resource Media. Photo courtesy Flickr user republicanconference. Essays in the Range blog are not written by High Country News. The authors are solely responsible for the content.